A file with the INI file extension is a Windows Initialization file. These files are plain text files that contain settings that dictate how something else, oftentimes a program, should operate. Various programs have their own INI files but they all serve the same purpose. CCleaner is one example of a program that can use an INI file to store the different options that the program should have enabled or disabled. This particular INI file is stored as the name ccleaner.ini under the CCleaner installation folder, usually at C:\Program Files\CCleaner\. 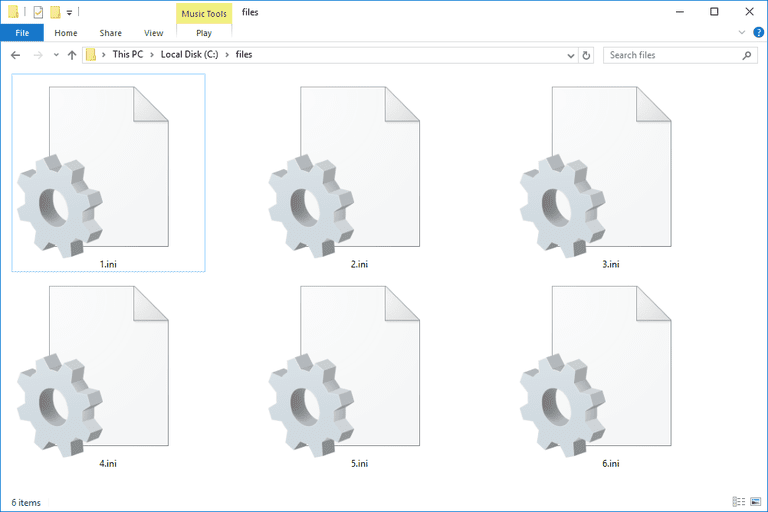 A common INI file in Windows called desktop.ini is a ​hidden file that stores information on how folders and files should appear. 'CCleaner.ini' File Open in Notepad++. It's not a common practice for regular users to open or edit INI files, but they can be opened and changed with any text editor. Just double-clicking on an INI file will automatically open it in the Notepad application in Windows. See our Best Free Text Editors list for some alternative text editors that can open INI files. It's important to understand that not all INI files work in the same way because they're built specifically for use within a particular program. Some INI files are really tiny (a few kilobytes) with only one or two lines of information, and others can be extremely lengthy (several megabytes) with lots of customizable options. In this example, CCleaner defines the English language with the 1033 value. So, when CCleaner opens, it reads the INI file to determine in which language to display the program text. Although it uses 1033 to indicate English, the program natively supports other languages, too, which means you can change it to 1034 to use Spanish instead. The same can be said for all the other languages the software supports, but you have to look through its documentation to understand which numbers mean other languages. This particular example is in the INI file that CCleaner uses. You can change this INI file yourself to add more options to the program because it refers to this INI file to determine what should be erased from the computer. This particular program is popular enough that there's a tool you can download called CCEnhancer that keeps the INI file updated with lots of different options that don't come built-in by default. Some INI files may have a semicolon within the text. These just indicate a comment to describe something to the user if they're looking through the INI file. Nothing following the comment is interpreted by the program that's using it. Key names and sections are not case sensitive, at least in Windows. This means that the same effect is produced in an INI file that uses uppercase letters as one that has lowercase letters. A common file called boot.ini is used in Windows XP to detail the specific location of the Windows XP installation. If problems occur with this file, see How to Repair or Replace Boot.ini in Windows XP. A common question relating to INI files is whether or not you can delete desktop.ini files. While it's perfectly safe to do so, Windows will just recreate the file and apply default values to it. So, if you've applied a custom icon to a folder, for example, and then delete the desktop.ini file, the folder will just revert back to its default icon. INI files were used a lot in early versions of Windows before Microsoft began encouraging the shift over to using the Windows Registry to store application settings. Now, even though many programs still use the INI format, XML is being used for the same purpose. If you're getting "access denied" messages when trying to edit an INI file, it means you don't have the proper administrative privileges to make changes to it. You can usually fix this by opening the INI editor with admin rights (right-click it and choose to run it as administrator). Another option is to copy the file to your desktop, make changes there, and then paste that desktop file over the original. Some other initialization files you may come across that don't use the INI file extension are CFG and CONF files. Some programs even stick with TXT. There's no real reason to convert an INI file to another file format. The program or operating system that's using the file will only recognize it under the specific name and file extension that it's using. However, since INI files are just regular text files, you can use a program like Notepad++ to save it to another text-based format like HTM/HTML or TXT.